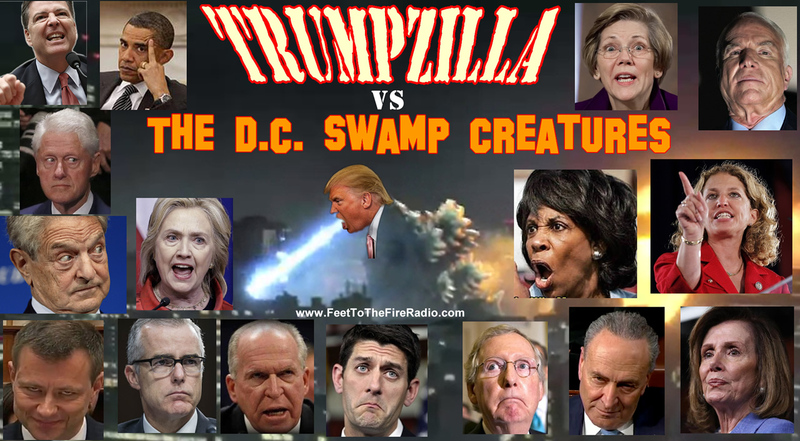 Trumpzilla, The Authentic American Daikaiju battles tyranny from the District of Columbia Swamp Creatures using those organic powers to work them like puppets to expose themselves and drive them mad in the process! The idea of balance in Creation can be seen in events like a raging forest fire. In the aftermath the fire itself promotes new fresh string grown. Too many predictors move into a region, the prey population dips to low and the predictors move on or die off. The Japanese mythology of a Kaiju is a “Strange Beast” that creation, itself, brings into existence with powers that are naturally tuned to defeat the evils of the beast it is there to fight. But it is very messy. We were given a change to change things in Ron Paul when he ran for president in 2012. His plans were economically sound, non-aggressive and peaceful. Plans to offer “real” money to compete with the fake fiat paper money. A way to bring down the dept in a matter of a few years while saving money on the military and protect our bordered without a wall. Plans to return control of education and healthcare to the states and open market competition to raise performance and save costs. He was an intelligent gentleman. He was pushed off the stage by the Deep State politicians. So… Creations sent in It’s Daikaiju. It’s “Large Strange Beast” organically grown, and fine tuned to beat the Beasts of the D.C. Swamp; but it will be turbulent and messy. The Swamp Creatures, as in the Daikaiju myths, sense their “natural enemy” and fear their utter demise and fight with all their might to thwart our authentic American Daikaiju, Donald J. Trump. If you complain about his methods, remember, we can only blame ourselves we had our chances to fix this ourselves. We did not. The Swamp Creatures got too strong (or we were too lazy) and Creation has sent in It’s weapon. The least we can to is help as we may to limit our own collateral damage. James A. Jancik is the host of Feet to the Fire Radio, now in it’s 16th year live weekly. Kaiju originally referred to monsters and creatures from ancient Japanese legends. The word “Kaiju” first appears in Classic of Mountains and Seas. After Sakoku, opening Japan to foreign relations, Japanese came to use the term kaiju to express concepts from paleontology and legendary creatures from around the world. For example, in 1908, during the Meiji period, it was suggested that the extinct Ceratosaurus was alive in Alaska, referred to as kaiju. However, there are no traditional depictions of kaiju or kaiju-like creatures in Japanese folklore but rather the origins of kaiju are found in film. The title of the first film with the name of the Kaiju is an atomic Kaiju appears (原子怪獣現わる Genshi Kaiju ga Arawareru), the title of The Beast from 20,000 Fathoms in Japan. Gojira (transliterated to Godzilla) is regarded as the first kaiju film and was released in 1954. Tomoyuki Tanaka, a producer for Toho Studios in Tokyo, needed a film to release after his previous project was halted and upon seeing how well American Hollywood giant monster movie genre films King Kong and The Beast from 20,000 Fathoms had done in the box offices of Japan, as well as personally being a fan of the films, Tomoyuki Tanaka set out to make a new movie based on those American giant monster movies and created Godzilla. Tomoyuki Tanaka aimed to combine Hollywood giant monster movies with the re-emerged Japanese fears of atomic weapons, which came about due to the Daigo Fukuryū Maru fishing boat incident, and so he put a team together and created the concept of a radioactive giant creature emerging from the depths of the ocean which would become the iconic monster Godzilla. Godzilla was initially met with commercial success in Japan, inspiring an entire genre that came to be known as kaiju movies. Daikaiju (大怪獣 daikaijū, large kaiju) roughly translates as large strange beast, and refers to the larger monsters. The literal translation is about a size difference between a kaiju and a daikaiju, with the implication that the daikaiju is the greater of the two types. The exact definition of what determines a kaiju from a daikaiju is debated. This term is used for the most powerful kaiju, the prefix dai- emphasizing great power or status. The first appearance of Daikaiju is in the Japanese title Rodan, Sora no Daikaijū Radon (空の大怪獣 ラドン, “Radon, Giant Monster of the Sky”). Godzilla, Rodan and Mothra are the san daikaiju, the three great kaiju. Free to use/share the picture unedited. This entry was posted in News and Politics and tagged Corruption, Deep State, NWO, Trump Swamp by BLKnight. Bookmark the permalink.